To help jog your memory of the literal & visual definitions of the Elements of Art you are going to create an info-graphic resource to go into your sketchbook. Using the circle template provided, draw 1 circle on the LEFT FLAP with pencil – very lightly. Use graphite to demonstrate the shading technique, BLENDING, to create the illusion of form with a range of 3-5 values on a sphere. DO NOT FORGET about the reflective highlight & highlight. Using the circle template provided, draw another circle on the RIGHT FLAP with pencil – very lightly. 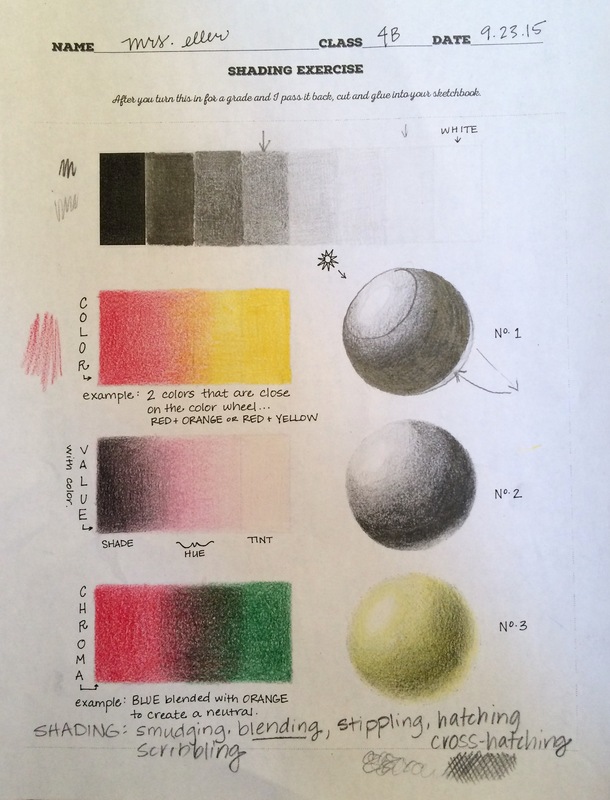 Use yellow, green, black & white to demonstrate the shading technique, BLENDING. Create the illusion of form with a range of 3-5 values on a sphere, including the shade & tint. DO NOT FORGET about the reflective highlight & highlight.